There’s something about fresh sage cooked in a little olive oil to the point of perfection! 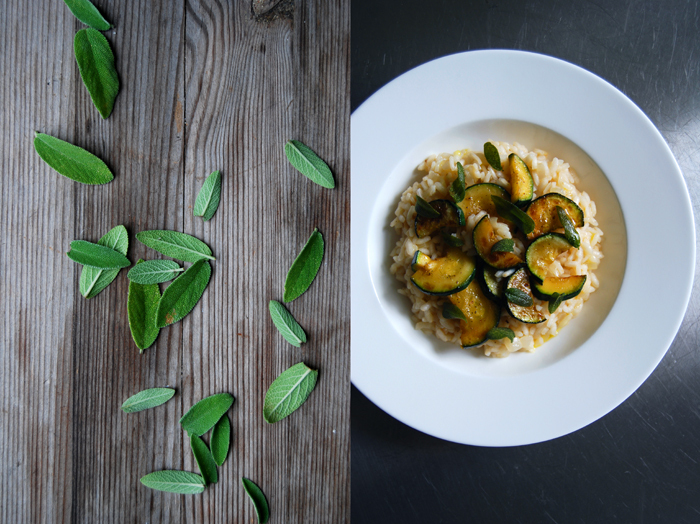 When the thick leaves become all glossy and golden, crisp and so full of flavour that they turn a simple dish into a fragrant composition with such ease – that’s exactly what this bunch of herbal crunchiness did with my simple risotto! 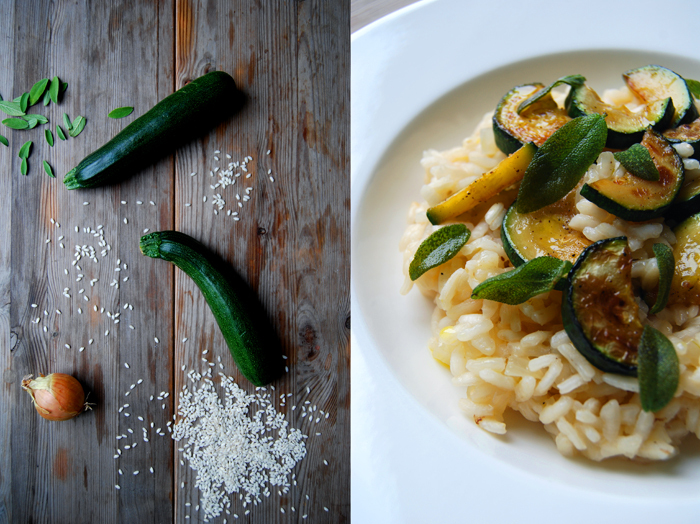 Our dinner started innocent and pure, I just cooked my Arborio rice with some chopped onions in white wine and broth before I mixed in juicy slices of golden sautéed zucchini. The vegetable added a fruitiness which made the whole composition light and fresh, but the crisp sage leaves on top put it on another level. The rich oil they cooked in was an aromatic concentrate of the herbs best qualities, warm and strong! When I arranged the risotto on the plates, I poured this herbal essence over the rice to coat them with this golden syrup. 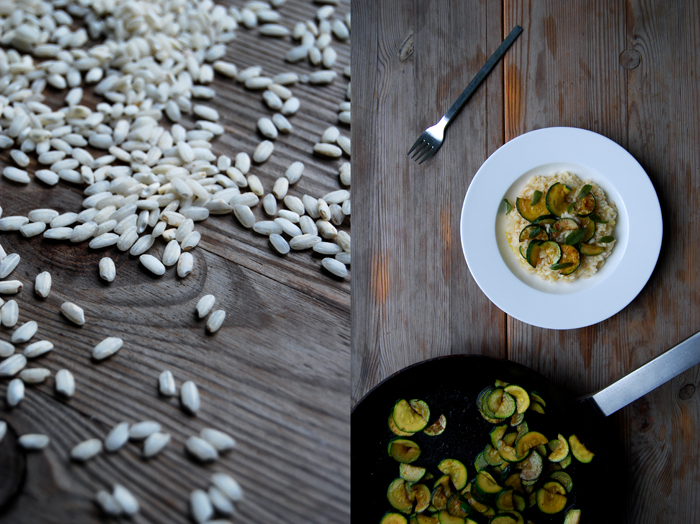 That’s the secret to a great risotto (and not only for risotto), combining just a handful of ingredients that allow their individual qualities to spark! 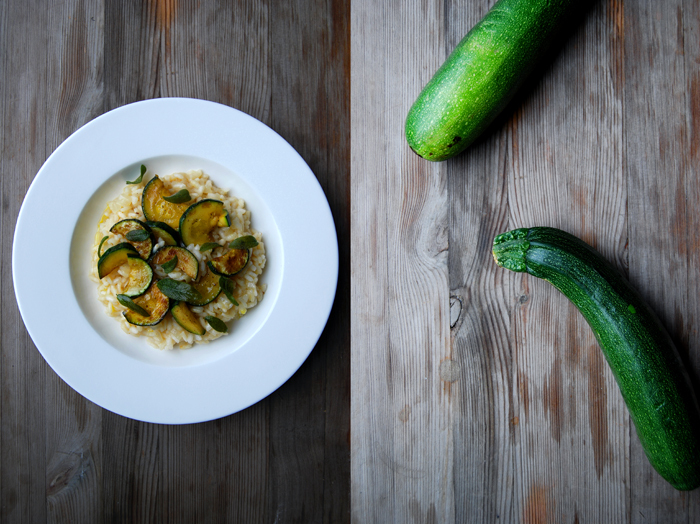 Sauté the zucchini in a little olive oil in a pan until golden on both sides and soft. Season with salt and pepper to taste and set aside. In a small sauce pan, heat 6 tablespoons of olive oil and add the sage leaves. Let them fry until golden and crisp, for about 1 minute but mind that they don’t turn dark, set the pan aside. In a large pot, heat a splash of olive oil and the butter, add the onions and cook on medium heat for about 2-3 minutes until soft. Stir in the rice and cook on medium heat for about a minute. Add the wine and some of the broth, the rice should be covered, stir and turn the heat down to medium-low. When the liquid has been absorbed add more broth, a little at a time stirring in between. Depending on the rice, it will need more or less liquid. When the rice is al dente and the broth is more or less absorbed take it off the heat and season with salt and pepper to taste. 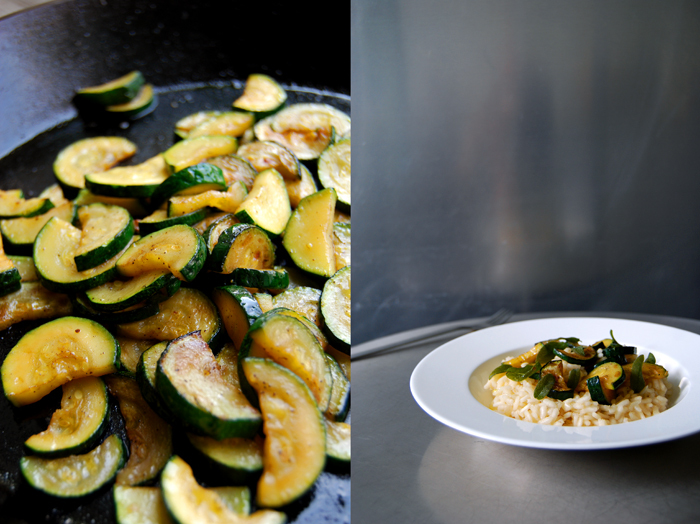 Close with a lid and let the risotto sit for a minute. 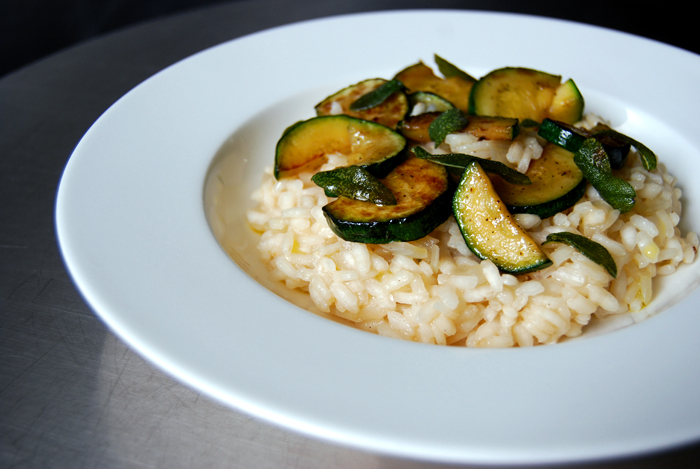 Divide the risotto and zucchini between the plates, sprinkle with some of the sage oil and top with crisp sage leaves, serve immediately. This looks delicious. I just fried up some sage for a soup topping, but I can imagine how good it must be with creamy risotto. The toppings really make or break any dish for me :-). Can’t wait to try this!